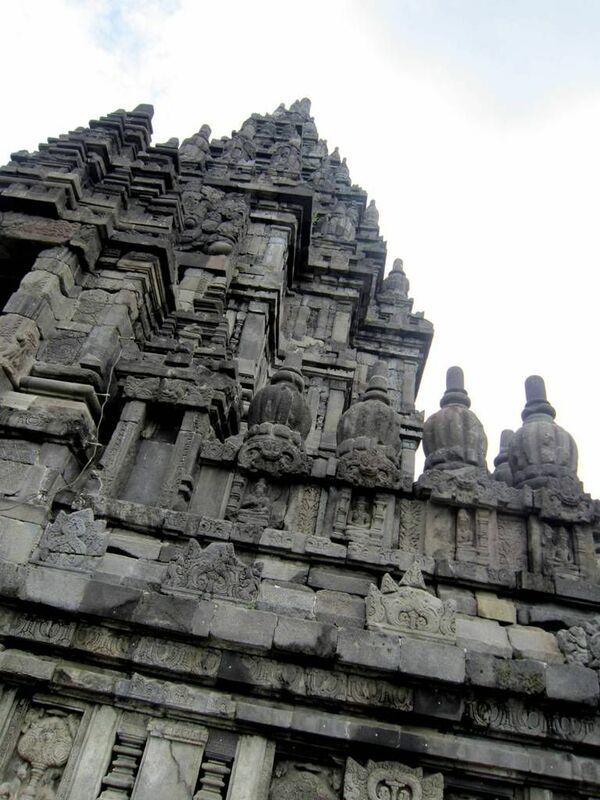 So on to the Prambanan temples. Although we stayed up very late the previous night to watch Kiai Kanjeng (will get to this soon), we set off very early in the morning to reach here on the same day we went to the gorgeous Parangtritis Beach. Welcome to Prambanan. It's so small kan? 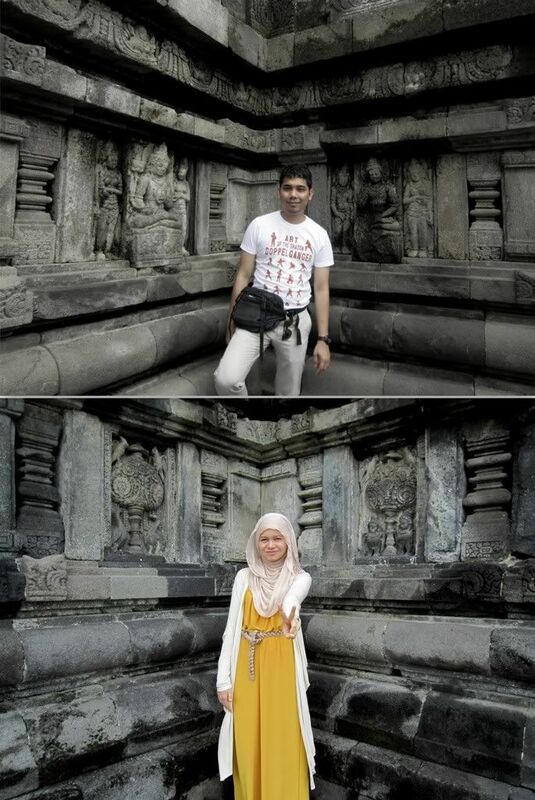 Actually, I didn't know much about Prambanan. 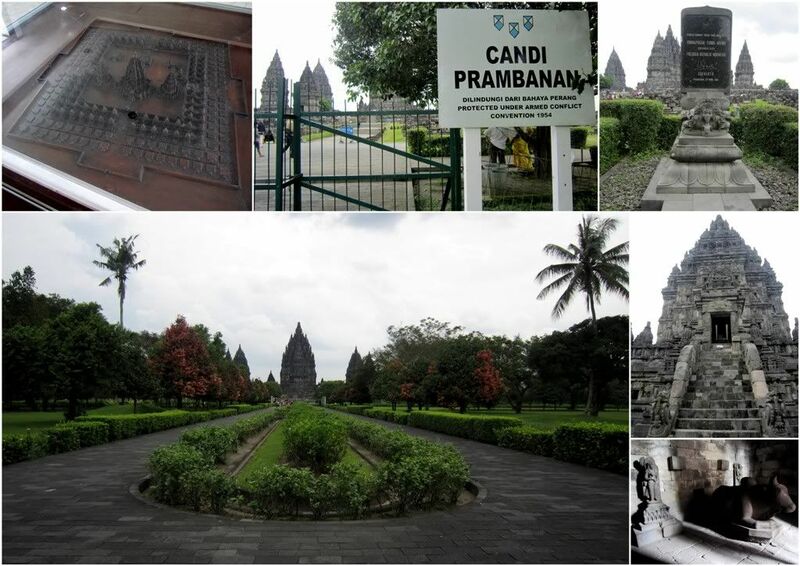 Even when we arrived, my first impression on looking at Prambanan from afar was that it looked deceivingly small. I thought it wasn't that big. 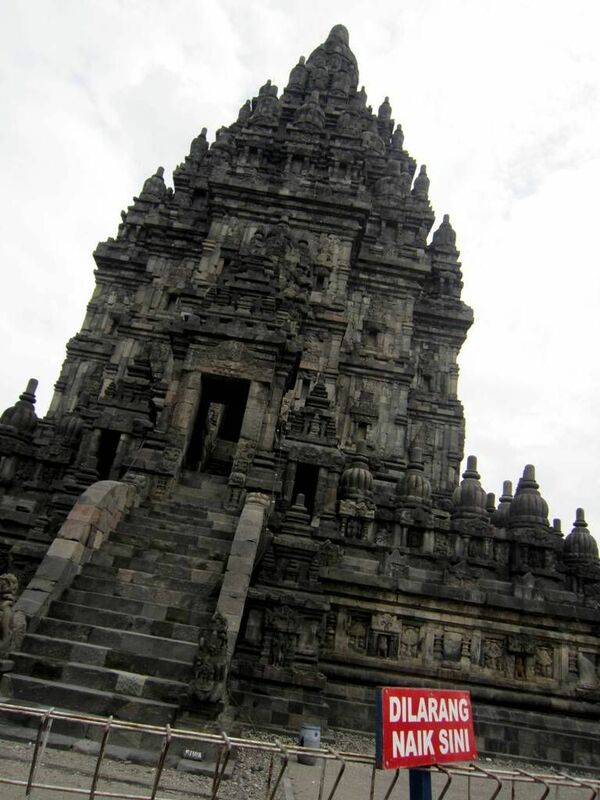 But Prambanan is apparently the biggest ancient Hindu temple in Java. 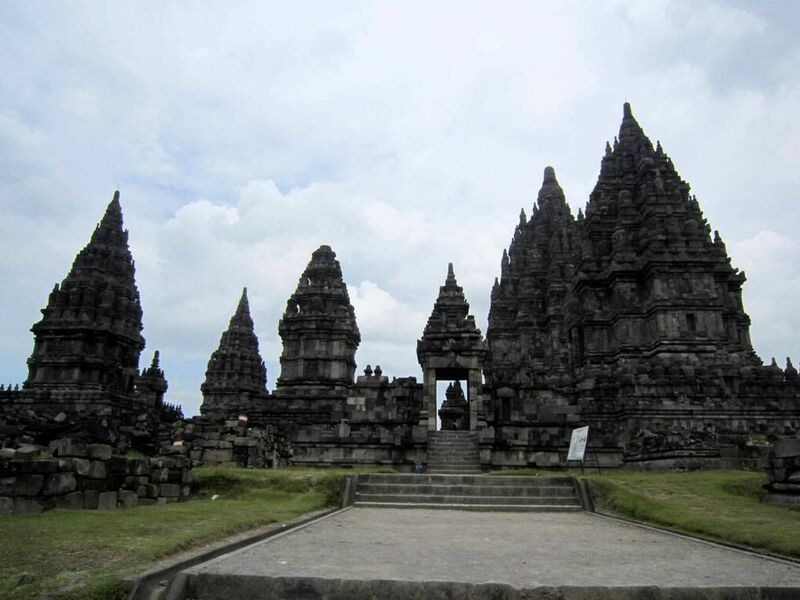 Prambanan is an 8th century temple complex comprising of 237 temples. Much of it are in ruins, and although there are continuous restoration works, most of the smaller temples cannot be restored. Only the foundation of the smaller temples are left, but the stones have been reduced to rubble. 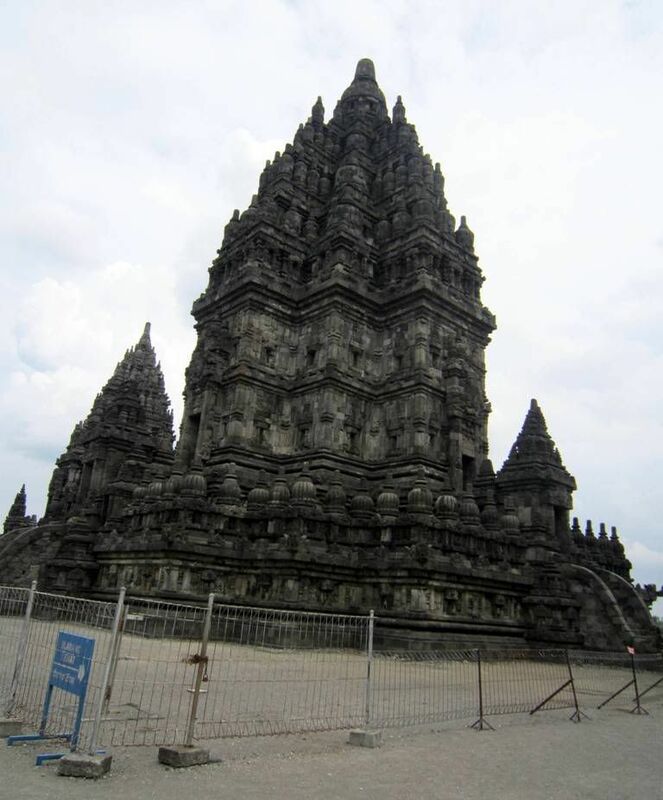 What is interesting about Prambanan is that they did not use cement for the stones, but an interlocking technique to keep the stones together (something like pasak i suppose). Pretty impressive, especially as there were different 'interlocking designs' on the various stones. Our guide mentioned that the designs were like puzzles, so you couldn't interlock one random stone with just any other stone: You have to find it's matching design. That's why restoration works are slow. The whole temples are like one big puzzle. Awesome right? The stones leading to the main temples. All that's left of the smaller candis. Even the smaller candis dwarf us. The biggest temple in the middle was closed because it was damaged during the earthquake back in 2006, so we were not allowed to go in. That's where most of the statues are. Our guide took us around the other temples and explained the stone carvings on the outer walls of the temples. There are stories in every carving and it has to be read from left to right. There were some "interesting" stories. Even some of the parts of the three main temples could not be entirely restored so the cracks and chips on the stones made the temples have even more character. Okay! Made it up the steps! 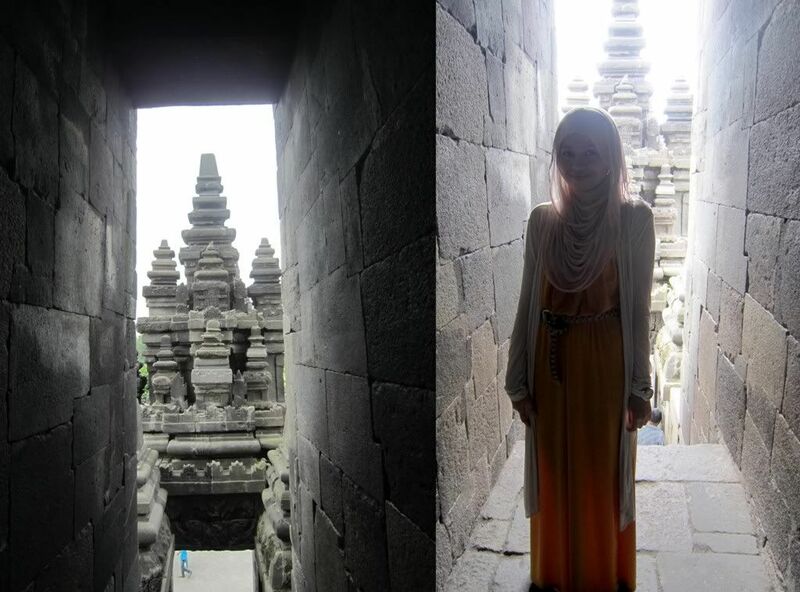 I almost forgot to mention that the entire compound surrounding Prambanan was enormous! 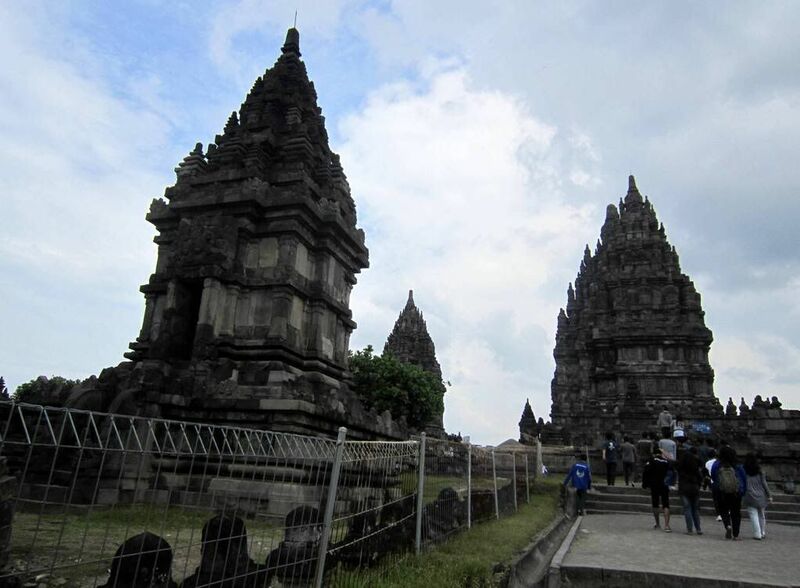 According to the guide, Prambanan was an important area of worship for the Hindus in the 8th century, but some time after that, they fled to Bali or East Java, probably because of the Merapi Volcano eruptions. 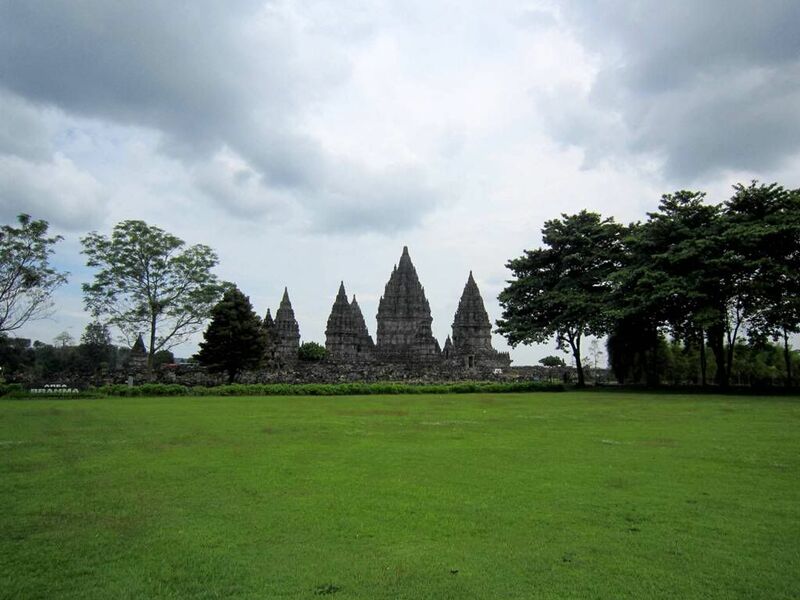 Prambanan was then neglected and was lost as the forest grew around it. 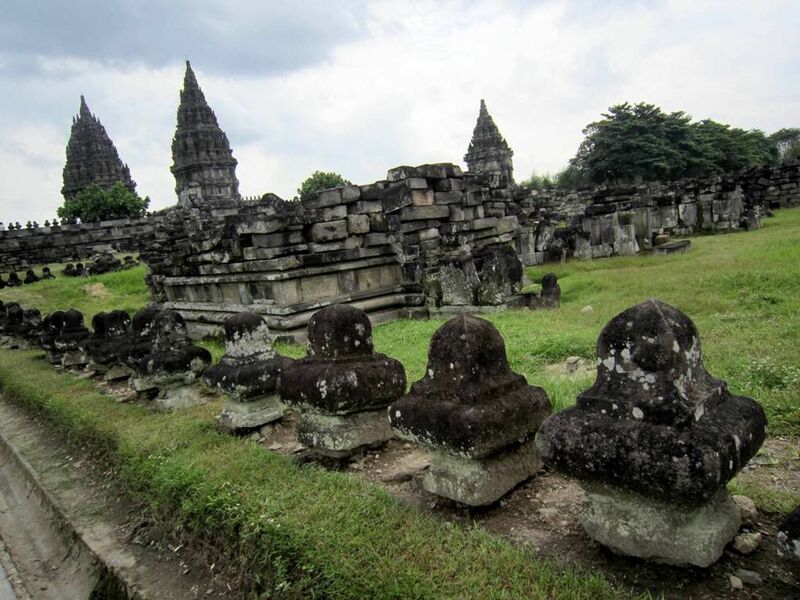 People even used to live around Prambanan in the jungle (and didn't even bother about the ruined temples) and they even took some of the stones for their own homes! But after the temple's discovery by the Dutch in the 1800s, the government of Indonesia relocated these people and set up a beautiful park which is really big. Even though I was all so excited and awed by the architectural design of the majestic temples, I was a little bit tired from all the climbing up and down the steps and from walking around the park. I think we spent 2 hours plus there. Luckily the guide knew a short cut to get to the exit otherwise that would be another one kilometer's walk, leaving me out of breath in the scorching hot sun. I love visiting reminders of the ancient past. It's just marvellous to look at all the intricate stone carvings and I can only admire how people were able to build such monuments in the past without the aid of technology. The stones are pretty big too, so they must have been strong in those days. I just wonder, centuries from now, whether people would admire our generation's architectural buildings the way we admire the buildings of the past? It makes me reflect on the hard work of our ancestors to build these buildings without cranes and all the effort to carve stones. In fact, it made me wonder about the workers who build all our buildings now. Even with technology I don't think its easier and that's something we shouldn't take for granted. And also, well done to the Indonesian government for preserving such an important piece of history for us and the future generation to be able to have a glimpse of the past. Okaay.. sorry for side-tracking. Enjoy the pictures! Just love the cracks and chips on the stones. Reminds me of my post last year, imperfections are beauteous. Sitting on the steps. It was good exercise but a little tiring towards the end. 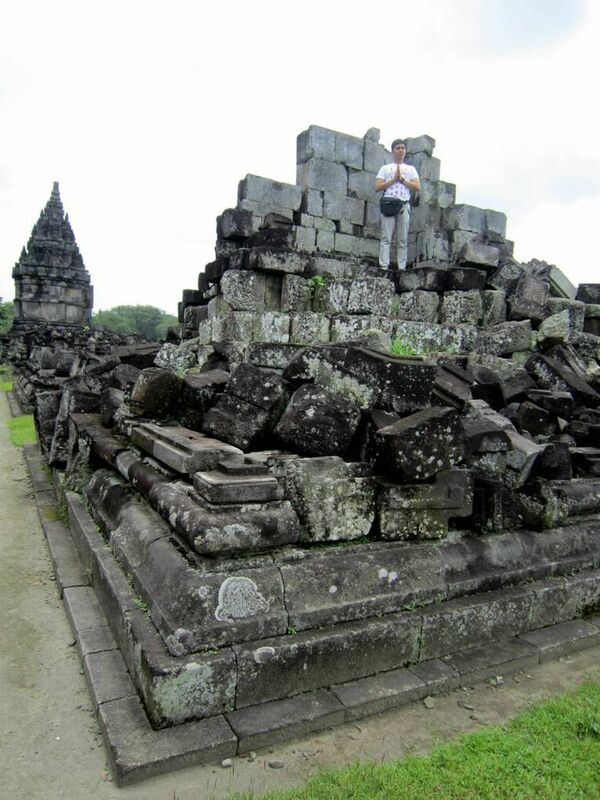 The ruins of Prambanan. Such a pity. Last shot. I didn't manage to take a picture of the whole park surrounding it. kalau dah lawa tu lawa juga! Always wanted to go there.. I love historical places. gosh. 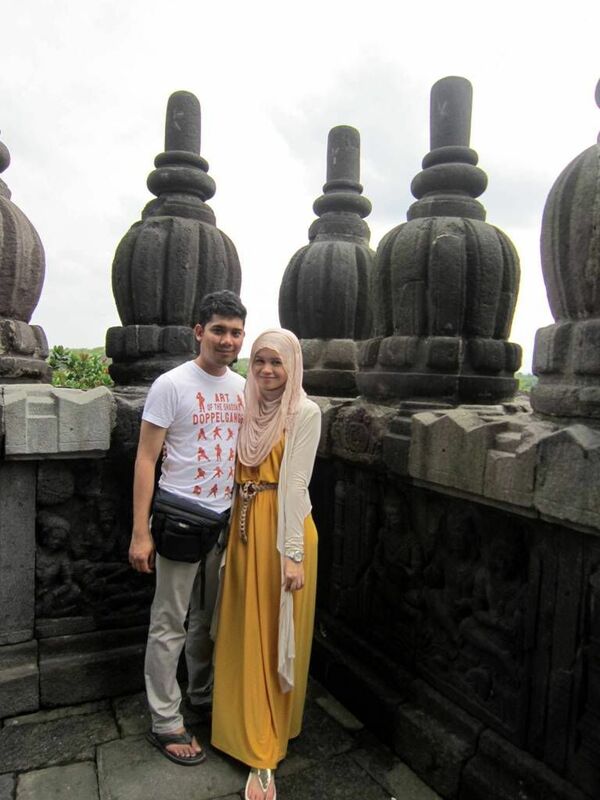 i've never been to yogyakarta before and ur description and pictures make me wanna go there badly..
Asalaam alaykom sister, btw I love how you wear the maxi with the hijab properly covering your chest, and with real style. I posted some photos from your blog on my blog before I read the copyright note on the bottom of your blog. Please let me know if you want me to remove the post or if it is okay to keep it:). I would love to keep it because the photos are so inspiring on how to to have a halal mixed wedding that is beautiful and stylish. In addition Jogja package, we also serve other destination (Solo, Dieng, Bali, Lombok, Bromo, Surabaya) Tours. If Mr / Mrs have low budget, we also provide car / van / bus with special price. Many more other package such as Jogja + Solo, Yogyakarta + Dieng, Semarang and Yogyakarta etc. Please do not hesitate to give a call to me at +6285104919010 / whatsapp me at +628985101301 (FREE). Many thanks for the attention.